The Patch is an industrial section near downtown Los Angeles, served by the Santa Fe. The area contains many old buildings and industries, served by a patchwork of tracks down streets and alleys. No one knows for sure where the name originated, but here are four possible theories: One, it refers to the “patchwork quilt” nature of the myriad of tracks in the area. Two, it could have been a reference that to work the area would be akin to being “thrown into the briar patch.” Three, it refers to the switchlamps on switches, glowing red and green in the night, reminiscent of a “patch” of strawberries or green vegetables. Four, the area was industrialized in the 1880s, so it’s also possible the name refers to the garden patches that existed prior to industrialization. The earliest reference found to the name is in a 1918 report on railroads in Los Angeles. The First Street 1918 Description is a page of the report that describes the area. 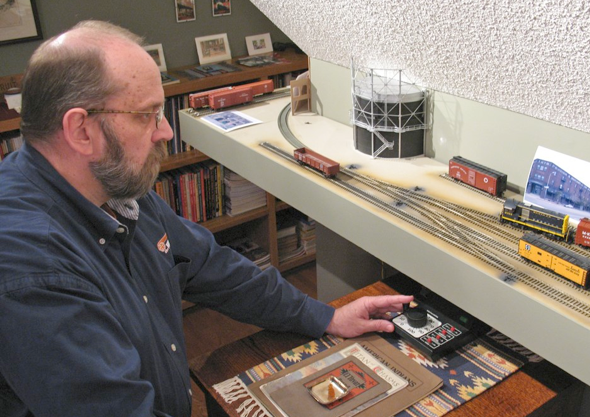 Keith Jordan switches the First Street Yard on his Patch layout shortly after construction. I invite you to spend some time looking around the site and exploring the Patch. If you have any questions, photos or information you’d like to share, let me know. Thanks for visiting.